In a different life, Lydia Loveless would be filed under post-punk. There’s the full-on urgency of late ‘70s music making, but with proper melodies, verses, and even choruses. Boy Crazy is repackaged version of a 2013 EP, plus a couple of covers and b-sides. One of those covers, Elvis Costello’s ‘Alison’, almost gives the post-punk game away. The original is, of course, perfect, but this version is pretty near perfect too. 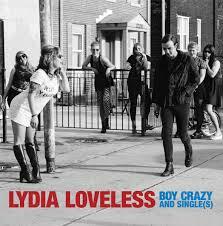 It’s difficult to escape the conclusion that in another universe, Lydia Loveless could have been up there with Nick Lowe, Robin Hitchcock, and Sir Declan of MacManus himself. But it’s this universe and with Lydia Loveless singing in a southern country drawl, despite her Ohio roots, it’s clear at least that she hails from nearer Nashville than Newham. Yet the mix of power-pop riffery and songs about men, and women, and men and women is just as intoxicating as similar songs from an earlier era. File under country-tinged-post-punk and enjoy. Posted in Lydia Loveless and tagged as Lydia Loveless, Music, Review.